Read a transcript of the video above at this link. High Watch has a rich history connected to Alcoholics Anonymous. Inspired by AA co-founder Bill W., High Watch was established in 1939 as the world’s first 12-Step treatment center. The debate over the role of Alcoholics Anonymous versus the role of professional treatment can be traced back to the first days of High Watch Farm. It was at that time, AA’s future was set to remain independent from the business of “treatment” for alcoholics. The colorful history of High Watch begins with Sister Francis, the woman who gave the farm to Bill W. in 1940. Sister Francis was born into a well-educated, affluent family with the given name of Ethelred Frances Folsom. She was most often called Sister Francis because of her affinity for the life and prayer of St. Francis. Sister Francis identified herself as a book illustrator and a landscape artist. Today, she is better known as a visionary and healer. Two interrelated themes stand out in Sister Francis’s life and writings: practical service to those in need of healing, and, the desire to let ’the real Christ self shine through’. “As she practiced healing, Sister Francis disagreed with the revivalist tenet of a man as a sinner. She wrote that it wasn’t easy for good “to manifest when they all think themselves sinners. It makes me realize more than ever the necessity of getting away from the teaching of evil and sin and fastening our minds on being sons of God.” She chose to live day to day and express all the joy she could. With a vision of creating a place of retreat for anyone in need of healing, Sister Francis purchased farmland in Kent, CT in 1926. She named it Joy Farm. 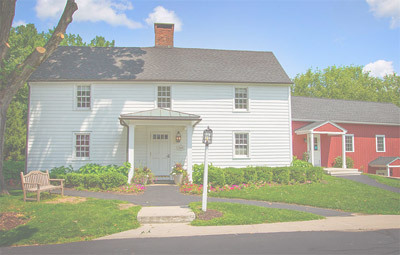 Joy Farm’s oldest building, an 18th century farmhouse, was called the Mother House. Sister Francis designated one room for a chapel, providing both healing and worship services. The Mother House offered “love, companionship, comforting, pity and tenderness” to all who came. Today, this building remains the spiritual center of High Watch housing the Chapel and offering comfort to all in need of healing. The Farm relied on freewill offerings for support. Guests included artists and writers like Eloise Lownsbery who wrote the children’s book, Lighting the Torch, at Joy Farm. Albert Grier, founder of the Church of Truth, was one of the better known guests. Notable to the role that High Watch would have on AA history, were guests Nona and Walter. Both had drinking problems but found they had no desire to drink when they spent their summers at Joy Farm. 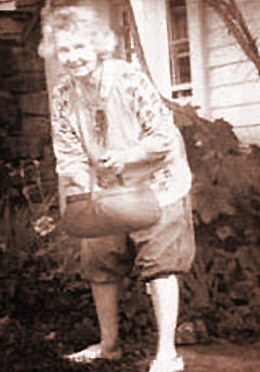 Nona was Marty Mann’s first successful 12 Step call. Marty, the first woman to maintain continuous sobriety in AA, was reading to Nona from the book Alcoholics Anonymous when Nona said the book reminded her of Joy Farm and Sister Francis. Nona felt that what AA was doing aligned with the principles and teachings of Joy Farm. Nona, Walter, Marty, Bill and Lois W. first came to Joy Farm on Nov. 4, 1939. They were to spend the weekend with Sister Francis. Marty Mann would later describe their arrival, “There was something there, something that was really palpable that you could feel and every one of us felt it. To say that we fell in love with it, is not to use the right terminology at all. We were engulfed…What is at the Farm was already at the Farm before we ever found it. It found us, in my opinion.” Bill W. is famously known for describing the spiritual atmosphere upon their arrival as being so thick, you could cut it with a knife. AA members fell in love with the Farm and Sister Francis fell in love with AA. 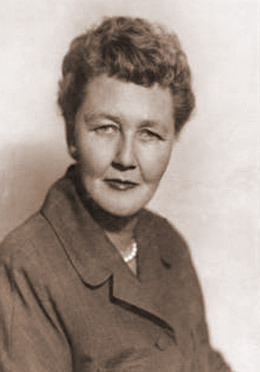 She thought AA members “were living the way she believed.” What she understood of AA clearly resonated with the traditions and principles of the Ministry of the High Watch. By 1939, AA Members began to stay at the Farm. 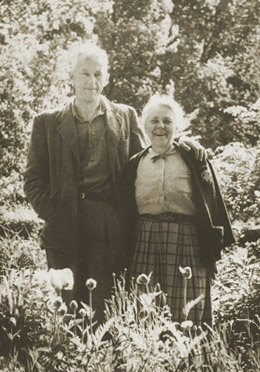 Bill and Lois W. spent six weekends at the farm that first summer, when Joy Farm officially became High Watch Farm. A Not-for Profit 501(c)(3) Organization was formed and in the fall, AA members were asked to serve on the Board of Directors. Marty Mann, Walter W. and Ray Campbell were elected to the first board in October 1940. Now, seventy years later, High Watch remains a non-profit dedicated to healing those suffering from the chronic illness of drug and alcohol addiction. Each resident receives state-of-the-art, customized medical care while learning the lessons on how to stay sober through the spiritual teachings and practice of the 12 Step principles of Alcoholics Anonymous.